The Charlotte Mason philosophy is full of riches for any parent. But, it is an educational philosophy, not a parenting philosophy. There are some areas that Charlotte Mason does not address, like how to handle all of those toddler temper tantrums! Finding a parenting philosophy that aligns perfectly with Charlotte Mason’s beliefs is probably close to impossible. When I taught in a Charlotte Mason school, I learned about Love and Logic parenting. This is a parenting philosophy that uses natural consequences, no lecturing, and gives children the power to make decisions. Love and Logic Magic for Early Childhood: Practical Parenting From Birth to Six Years is the book to read during your child’s early years. This has helped us tame toddler temper tantrums, and establish boundaries for our children- and for us as parents. Parenting With Love And Logic focuses on older children, but there is value in reading it even when your children are young. Young children don’t feel like they have any control, so they’ll fight for it any way that they can. Letting them choose between two options that you’re okay with is a good way to let them have some control. 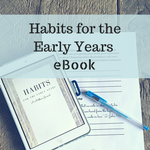 You might say, “Do you want oatmeal or cereal for breakfast?” “Do you want to play outside or read a book?” The authors say that you should make sure to give options that don’t inconvenience anyone! In the Charlotte Mason Early Learning Facebook group, someone asked a wonderful question: Doesn’t giving children choices between two different things exhaust them? Or, when I’ve asked Miss H to clean her room and she doesn’t, I say, “I can clean it for you, if you want.” She knows that means I will gather everything into a basket and put it in my closet for a day or two. Meeting basic needs in the early years is mandatory for building a strong relationship with your child. As your child gets older, it’s important to strengthen the relationship through play, and paying attention to your child’s interests. Charlotte Mason wrote a lot about properly caring for children in Home Education, and stressed the importance of a positive relationship between parent and child. There are a couple of things that don’t line up well. The Charlotte Mason philosophy works on improving habits, and if a negative behavior continues willfully, consequences are allowed (if natural) or applied (if relative). Love and Logic jumps right into consequences. I think that’s good sometimes (for example, scooping up a child who’s having a temper tantrum and putting them in their room), but in some cases, a child needs instruction and practice. Some of the consequences mentioned in the book seem like shaming. There was an example of parents making the children pay for a babysitter (because they were causing lots of trouble and couldn’t go to an event) with their toys. The parents kept saying, “No, that’s not enough,” and had fun as their daughters brought them more and more toys. This seems somewhat disrespectful to a child’s personhood. We’ve been using choices for awhile now, and it makes a huge difference in our day. I give options like, “Do you want me to put your brother in the car first, or you in the car first?” I also use enforceable statements in some cases. When I have trouble getting Miss H to eat her meal, I say things like, “Dinner is over in 10 minutes.” That feels less like bribery and more natural to me. The use of consequences (if I feel like we’ve worked on a habit or it is otherwise needed) is helpful too. I’ve noticed that it helps me feel less angry if I can just give a consequence rather than trying to lecture or punish when emotions are high. Recently, we’ve started using this with E, who has some very strong temper tantrums! We put him in his crib when the tantrum starts, and tell him that he can come out when he’s quiet. It was amazing how quickly he picked up on this, and the 30 minute tantrums stopped almost immediately. Do you have a parenting philosophy that you love? Tell me about it in the comments! 5 Reasons We Love Preschool at Home!